- A bacterium. Helicobacter pylori bacteria commonly live in the mucous layer that covers and protects tissues that line the stomach and small intestine. Often, the H. pylori bacterium causes no problems, but it can cause inflammation of the stomach's inner layer, producing an ulcer. - It's not clear how H. pylori infection spreads. It may be transmitted from person to person by close contact, such as kissing. People may also contract H. pylori through food and water. - Regular use of certain pain relievers. Taking aspirin, as well as certain over-the-counter and prescription pain medications called nonsteroidal anti-inflammatory drugs (NSAIDs) can irritate or inflame the lining of your stomach and small intestine. These medications include ibuprofen (Advil, Motrin IB, others) and naproxen sodium (Aleve, Anaprox, others), but not acetaminophen (Tylenol). - Peptic ulcers are more common in older adults who take these pain medications frequently or in people who take these medications for osteoarthritis. - Other medications. Taking certain other medications along with NSAIDs, such as steroids, anticoagulants, low-dose aspirin, selective serotonin reuptake inhibitors (SSRIs), alendronate (Fosamax) and risedronate (Actonel), can greatly increase the chance of developing ulcers. - Smoke. Smoking may increase the risk of peptic ulcers in people who are infected with H. pylori. - Drink alcohol. Alcohol can irritate and erode the mucous lining of your stomach, and it increases the amount of stomach acid that's produced. - Internal bleeding. Bleeding can occur as slow blood loss that leads to anemia or as severe blood loss that may require hospitalization or a blood transfusion. Severe blood loss may cause black or bloody vomit or black or bloody stools. - Infection. 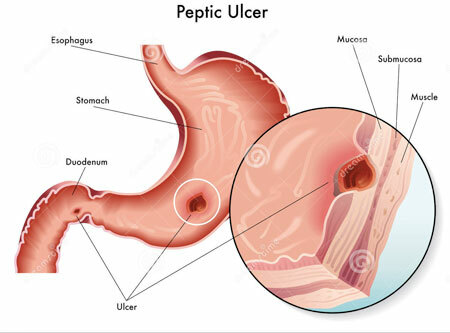 Peptic ulcers can eat a hole through (perforate) the wall of your stomach or small intestine, putting you at risk of serious infection of your abdominal cavity (peritonitis). - Obstruction. Peptic ulcers can lead to swelling, inflammation or scarring that may block passage of food through the digestive tract. A blockage may make you become full easily, vomit and lose weight. - Laboratory tests for H. pylori. Your doctor may recommend tests to determine whether the bacterium H. pylori is present in your body. He or she may look for H. pylori using a blood, stool or breath test. The breath test is the most accurate. Blood tests are generally inaccurate and should not be routinely used. - Endoscopy. Your doctor may use a scope to examine your upper digestive system (endoscopy). During endoscopy, your doctor passes a hollow tube equipped with a lens (endoscope) down your throat and into your esophagus, stomach and small intestine. Using the endoscope, your doctor looks for ulcers. - Upper gastrointestinal series. Sometimes called a barium swallow, this series of X-rays of your upper digestive system creates images of your esophagus, stomach and small intestine. During the X-ray, you swallow a white liquid (containing barium) that coats your digestive tract and makes an ulcer more visible.